Yes, I’ve gone all vintage camper crazy ever since we purchased our mini motorhome this past June! 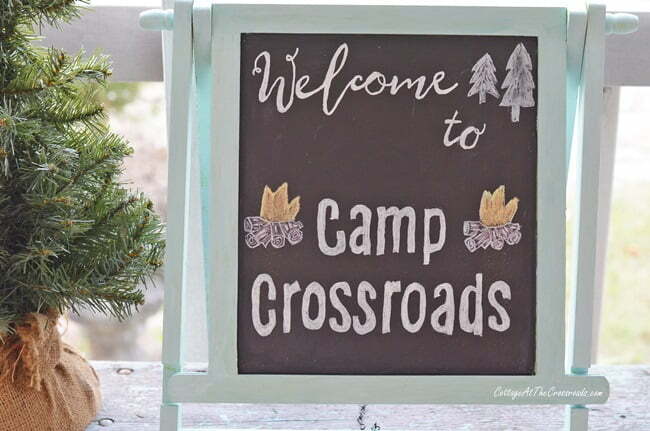 For the past few summers, we have jokingly called our home “Camp Crossroads” whenever the grandgirls have come to stay with us. So our vintage camper Christmas porch has been dubbed the same name. 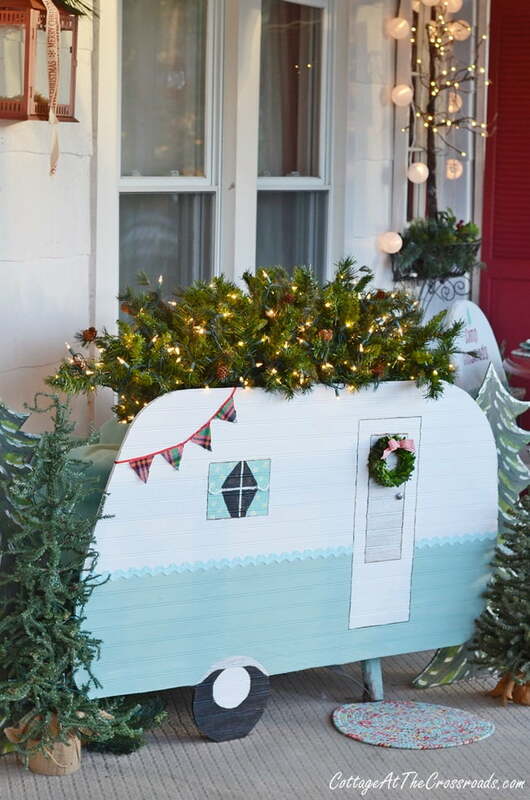 The feature of our Christmas front porch is this wooden vintage camper cutout. We had a piece of beadboard left over from our bathroom renovation this past fall that I saved because when we turned it sideways, the grooves reminded me of the metal siding on vintage campers. Lucy, our dog, seems to love the camper. I even caught her snoozing in front of it with her head on the little “rug” that I put in front of the door! Ever since we got our motorhome, I have been collecting or people have been giving me camping related items. This sweet pillow was a birthday gift from a friend. My sister-in-law made the pom poms to adorn it. 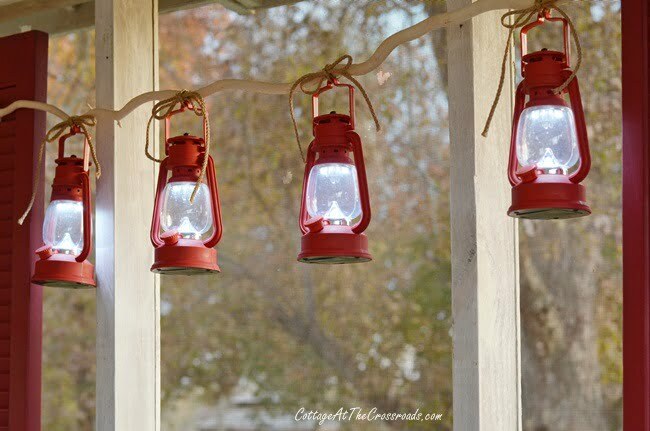 After deciding to decorate the front porch with a camping theme, I knew I was going to hang these red lanterns that we used on our outdoor Christmas wreaths a few years ago. 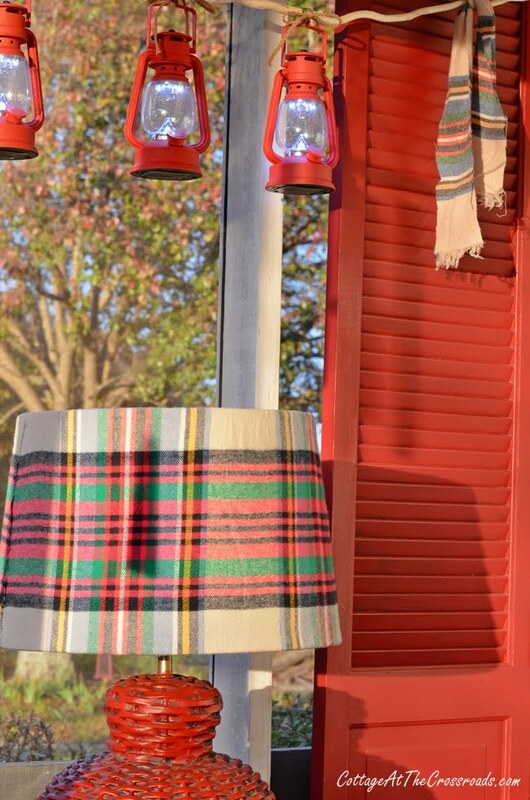 Here are more of them on the other end of the porch where my plaid lampshade is. 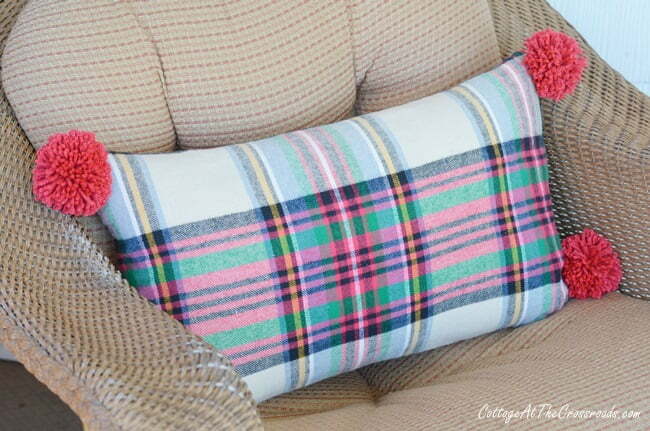 And I made a matching pillow out of the same plaid fabric. These pom poms were also made by my sweet SIL. Are you as crazy about pom poms as I am? Down on this end of the porch are also some vintage camper ornaments on the table. They are so adorable because they light up! 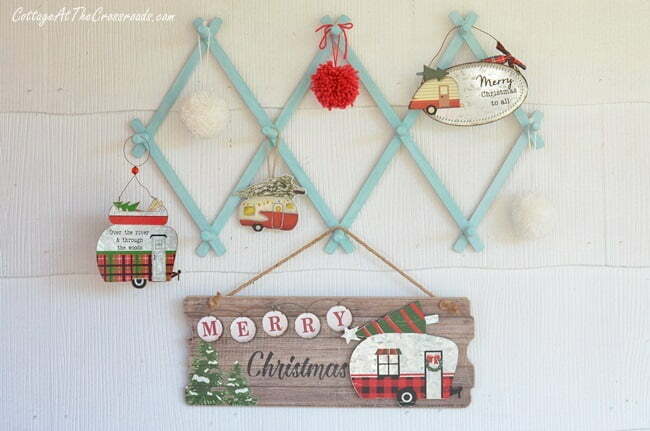 More vintage camper ornaments and a sign are hanging on the recently painted vintage wooden rack. 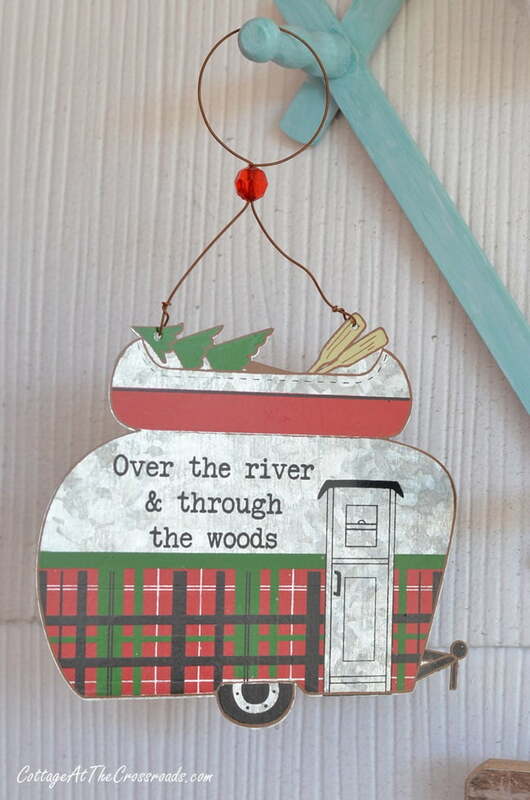 It has been more fun collecting these vintage camper ornaments this fall. They are everywhere! On the table near the seating area is a Christmas tree with red lantern ornaments that I found at Walmart. 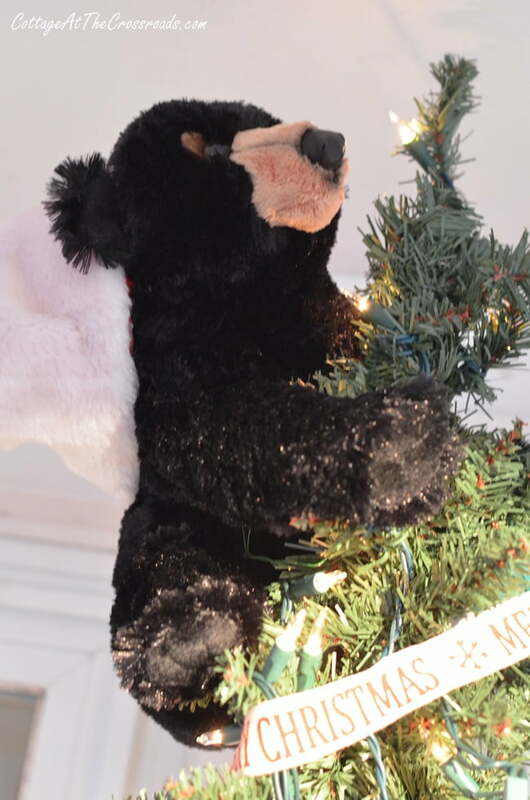 A black bear serves as a tree topper! He has on a stocking cap but you can’t see all of it in the photo. 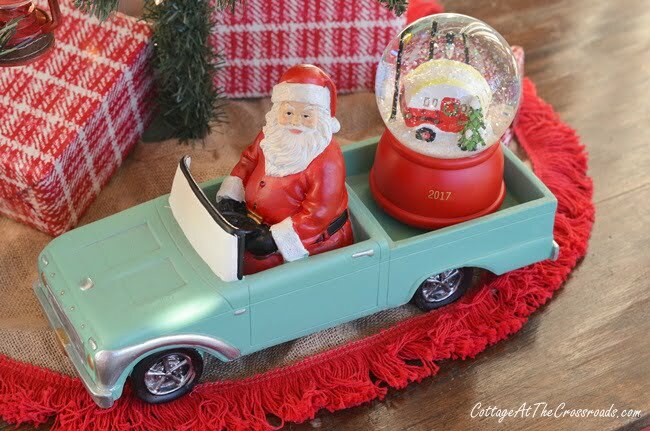 Santa has rolled into Camp Crossroads in his vintage car carrying a camper snow globe. He’s going to spend the night in his matching vintage camper! 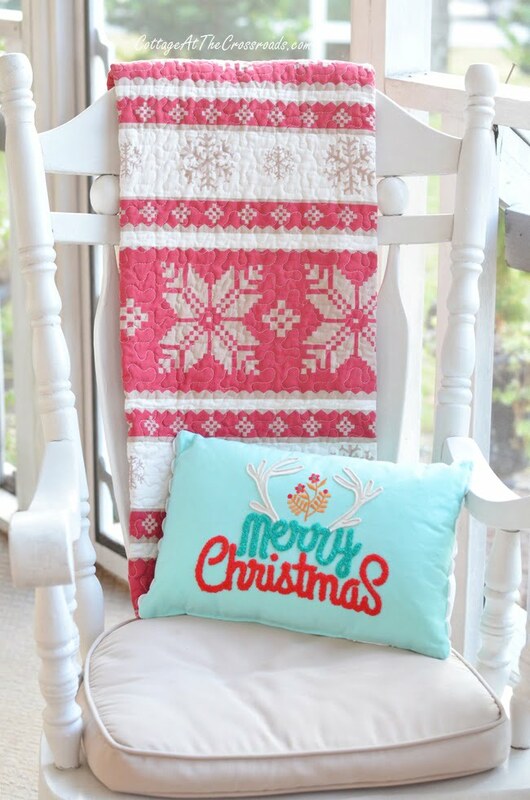 And I couldn’t resist putting this aqua and red Christmas pillow on my vintage camper Christmas porch! 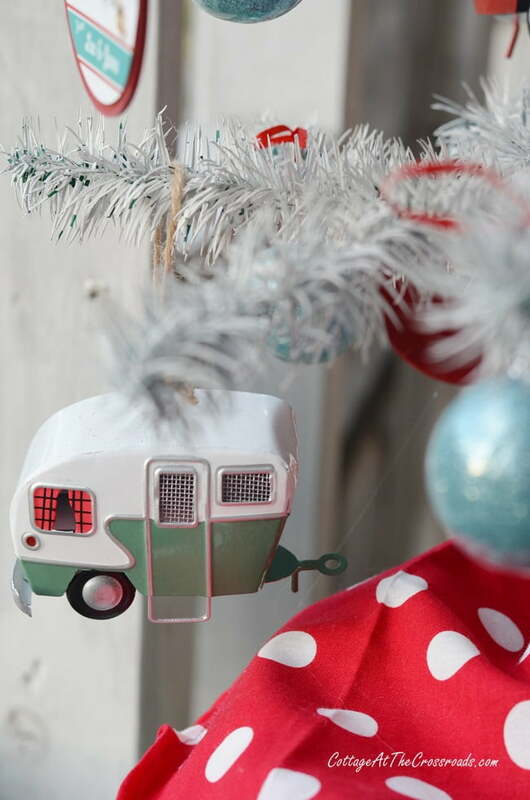 Midway down the porch is the reproduction feather tree loaded with……vintage camper ornaments! Yes, I told you I went crazy! At the top is a cute metal ornament. I know some of you don’t like snow, but here in South Carolina we yearn for a white Christmas. Another camper ornament hangs on the tree. I made a few of these round ornaments using gift tags with our names on them. 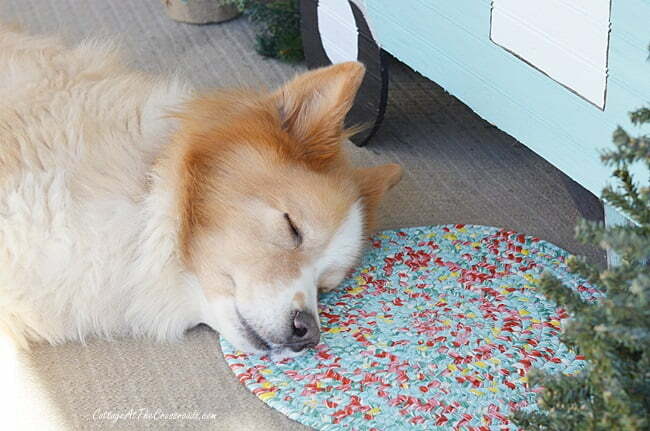 A mason jar lid serves as a base. The centerpiece on the table is a vintage lantern that we found here at the Crossroads when we moved in. I gave it a new coat of red paint and placed fairy lights inside. 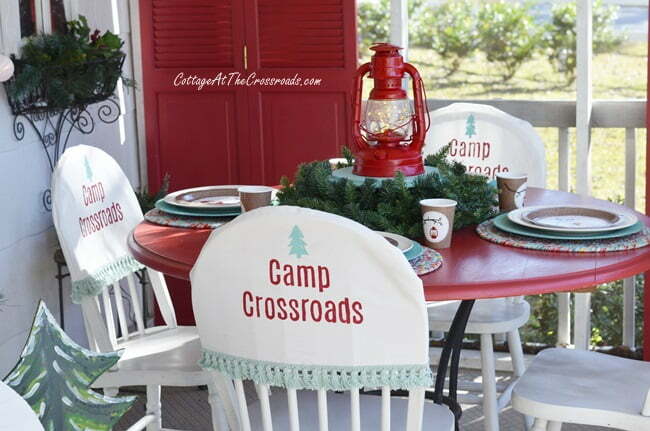 I couldn’t resist making more chair covers with the words “Camp Crossroads” painted on them. We actually use paper plates at Christmas when we have our large family gathering. The old ladder that is in the corner got decorated with more red lanterns and a vintage camper under a cloche. You can’t see it in the photo but the camper lights up, too, and reflects on the Epsom salt snow. 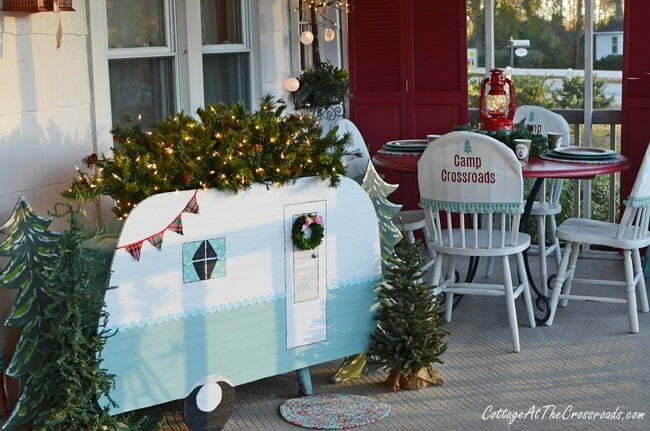 I hope you’ve enjoyed seeing our vintage camper Christmas porch! I had so much fun putting it all together, and I can’t wait until the grandgirls see it in person. 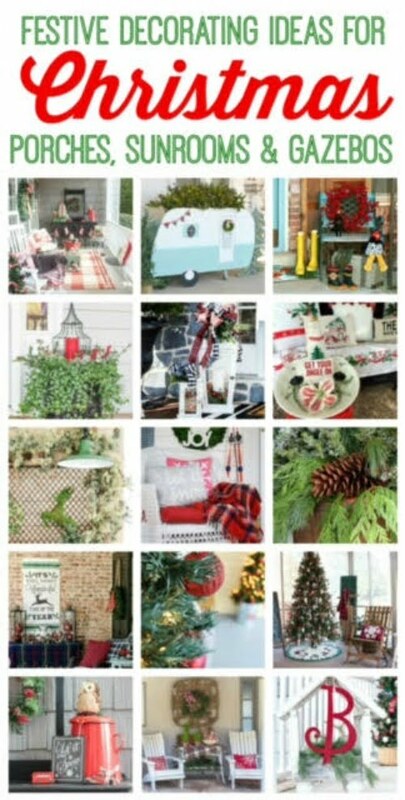 Today I’m joining some of my blogging friends who are sharing their Christmas decorated porches. Click on any of the links below to see more porch tours today and come back tomorrow to see even more! 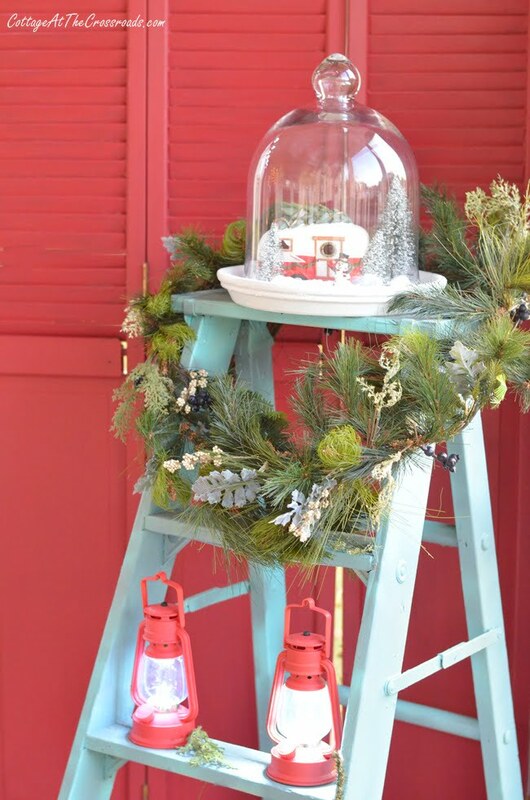 Prepared to be inspired with these festive Christmas decorating ideas for your front porch, sunroom, screened-in porch or gazebo. Cutest porch EVER. It makes me want to be invited to your family gathering, even though I am not a member of your family. Jane you make everything look so easy. Hope you have a Merry Christmas! Jane, once again your porch is adorable! That camper is the cutest thing I’ve ever seen! 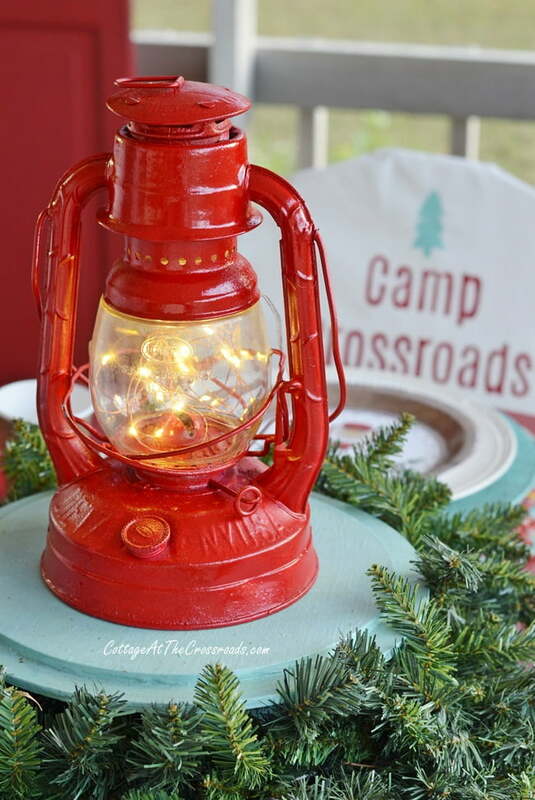 And all the of the ornaments and lanterns tie the camping theme together perfectly. I love your porch this year! It is adorable!! 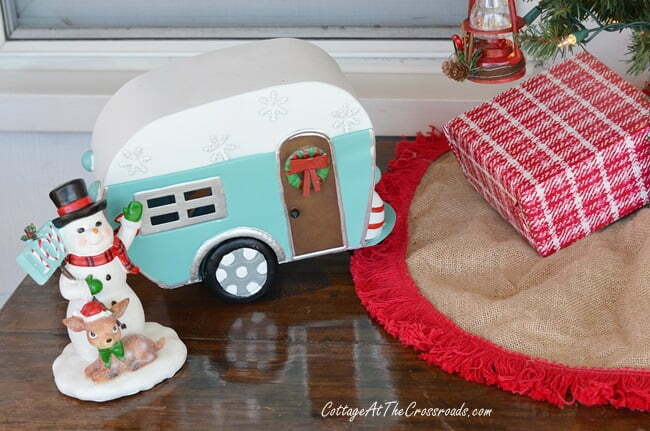 I love all the different camper ornaments and sweet Lucy napping by the rug! I love your porch! I need to find campers like yours. The chair backs are great. I really enjoyed seeing your fun ideas. Merry Christmas. Over the top cute Jane! Camp Crosswords is a winner! So many wonderful touches, I will be smiling all day! What an amazing vintage camper front porch!! You have literally “tipped the scale” on this one. I so enjoyed seeing all of your ornaments, lanterns, and homemade items. Lucy is so lucky to be a member of your family. Have a very merry Christmas. 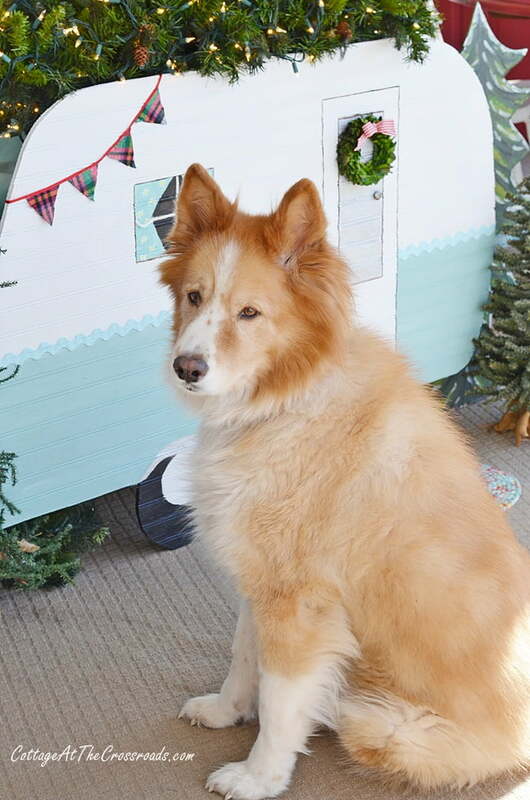 Thanks so much for showing us your darling camper and your sweet dog! Jane, this is the most adorable thing ever. I wish you could get it published in Trailer Life magazine. 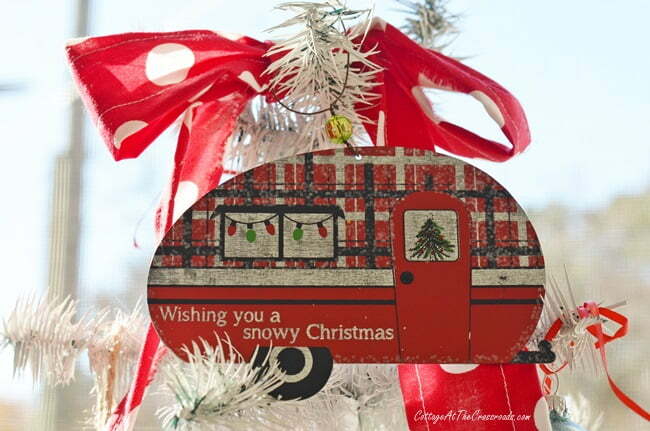 We are also campers and have a few ornaments and some free standing campers that wind up. 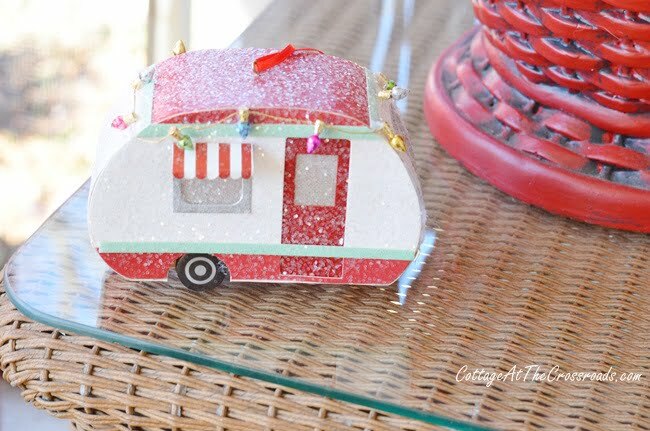 Our favorite ornament is, of course, in the shape of a camper and reads “RV There Yet?” Cracker Barrel usually has some cute camping related Christmas items. Merry Christmas to you, Leo, and Lucy. I love every single thing in this porch! The wood camper cutout is so CUTE!!!! 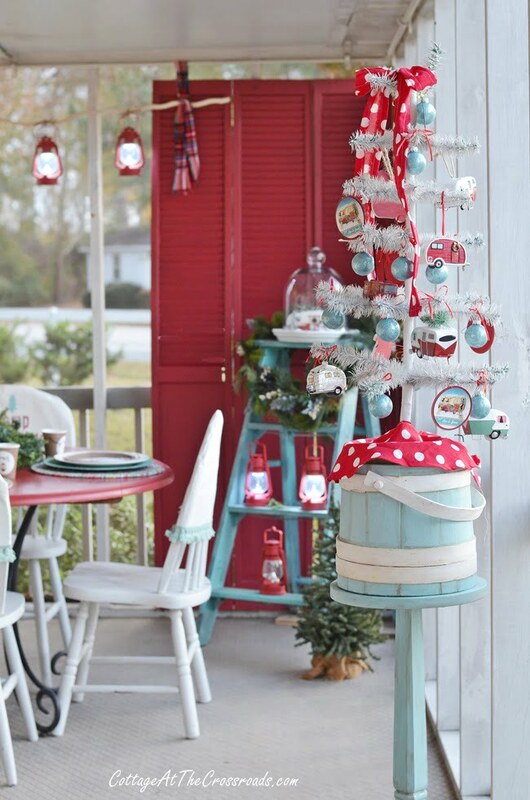 Your porch is perfect for the holidays! How wonderful! 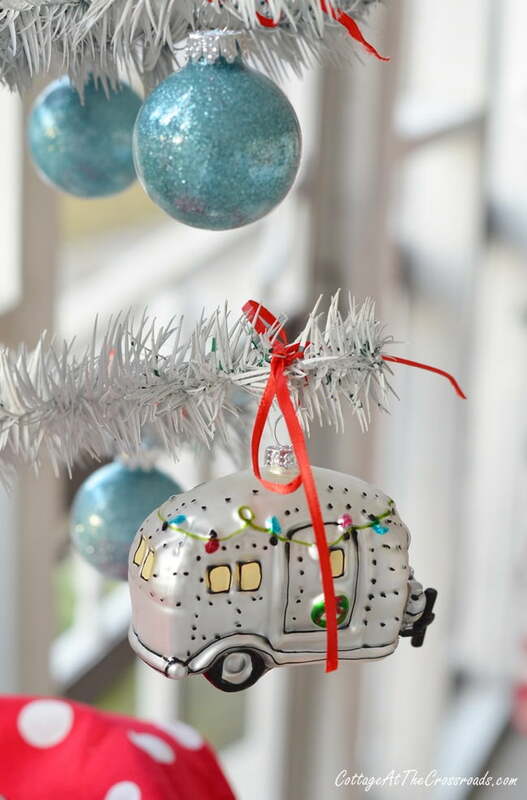 Everything is perfect, those vintage camper ornaments are just too cute – I need more! Love it all Jane!! It is always so much fun to see what you come up with my friend. 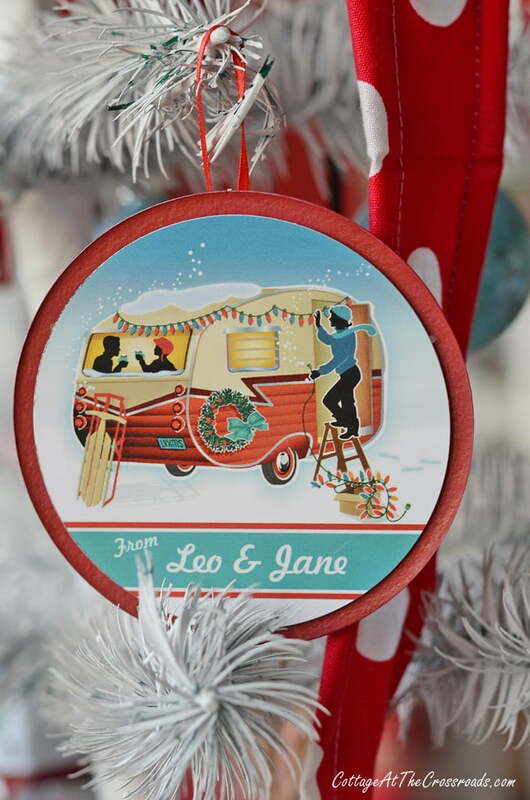 Jane (and Leo), I’ve been waiting to see your porch since you first shared the photo of the vintage camper you made. I am in love! Swoon. Seriously, I love the theme and all the thoughtful touches. 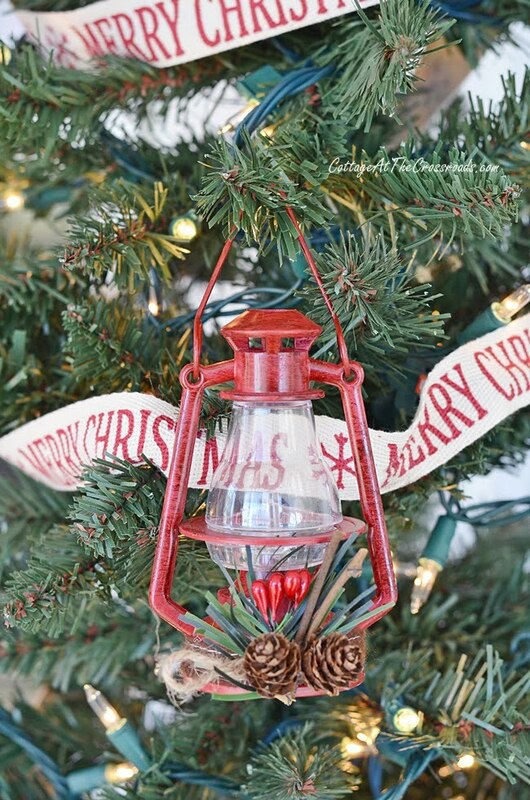 I am crushing on every single red lantern and vintage camper ornament. I want to spend my Christmas break at Camp Crossroads! 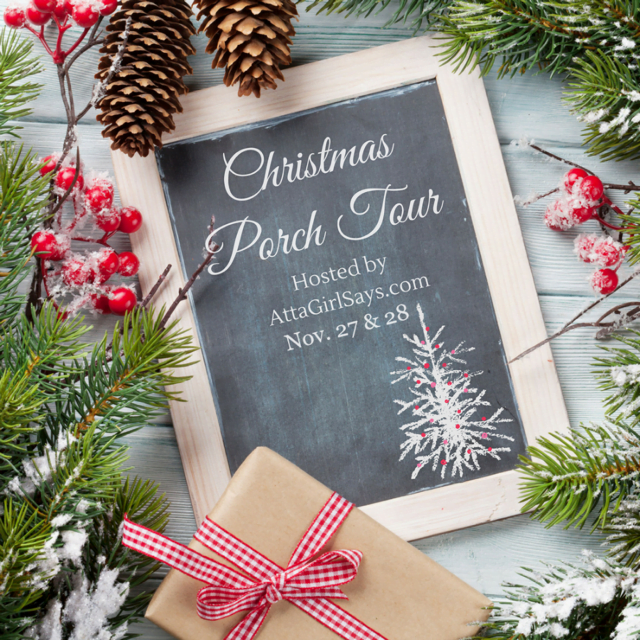 Thanks so much for joining the Christmas Porch Tour again this year. This is adorable. You have outdone yourself. I love it, the camper motif is positively adorable! The red is just popping! Well if your camper porch isn’t the the cutest, thing! 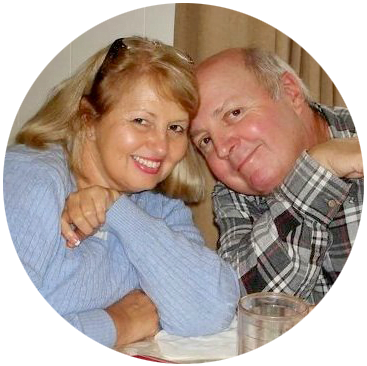 Love all of your creative accents–pinned & tweeted! Oh, Jane – how cute! What a wonderful theme for Christmas. 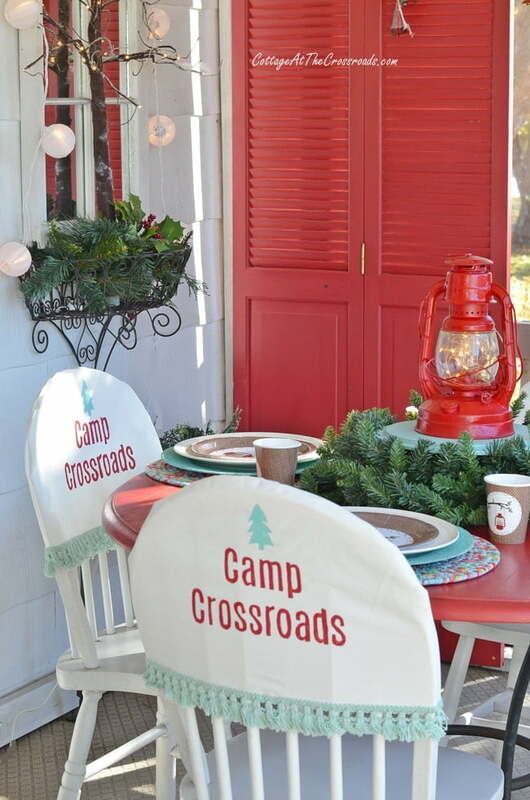 I think my favorites are the camper cutout that Leo made and the chair toppers that say Camp Crossroads. Great job! I am totally in love with your camper porch! 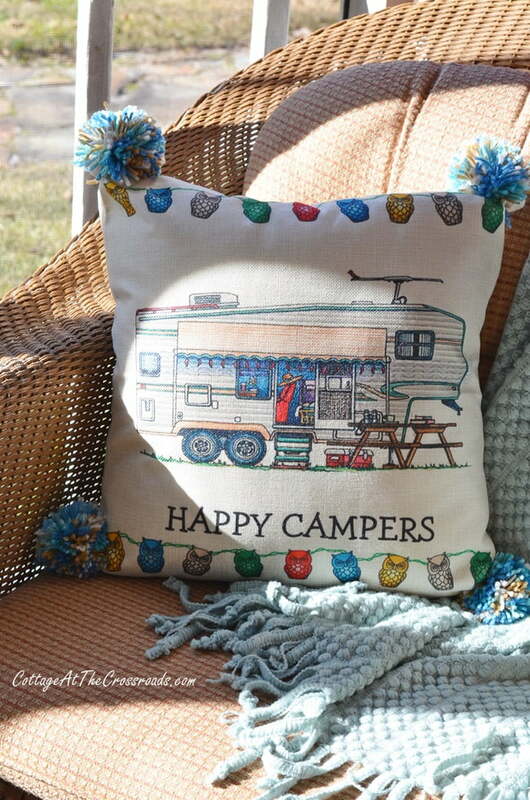 Your collection of camper ornaments is so fabulous. I have the same camper that you have under your cloche. 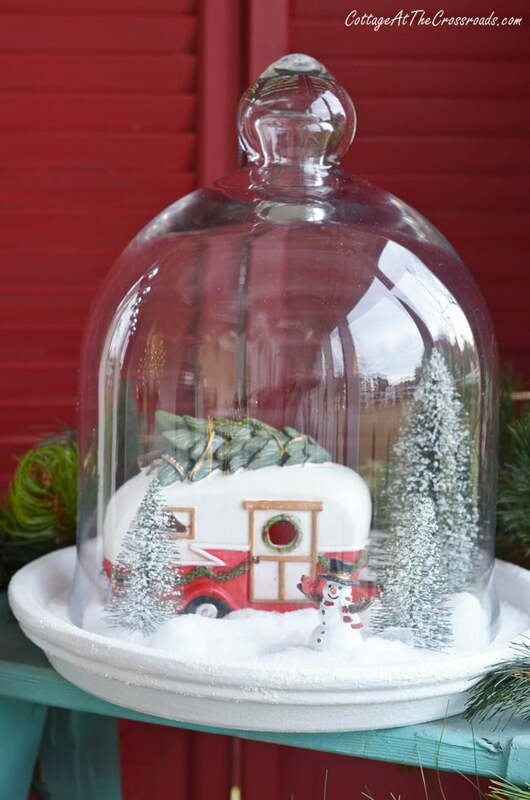 I bought a large apothecary jar this past fall and when I saw that camper I knew I had to make a Christmas scene with it. I also got the aqua camper and truck at Joann’s and made a jar scene for my sister. I also have gone crazy for plaid and it has become my Christmas decorating theme this year. Wow!!! I am just speechless. 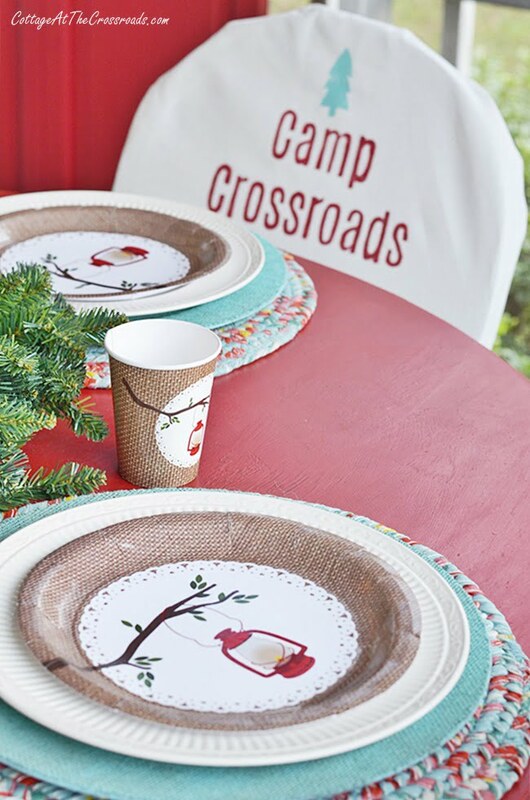 Camp Crossroads is adorable. And I LOVE the camper. Lucy has good taste! Oh my goodness! I so much enjoyed touring your camper themed porch. You added so many adorable details. I know your guests will spend a lot of time out there admiring every single thing. My favorite is the camper you and Leo made from leftover bead board. That is so cute! I predict a lot of folks will want to pose for pictures beside it this holiday season.